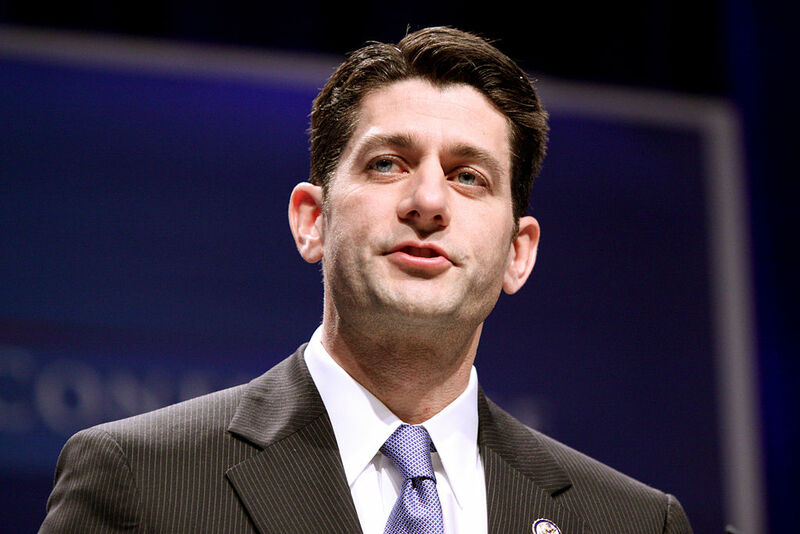 Ryan’s proposal is for what he calls “premium support” programs. Think premium like an insurance premium, not like a Cadillac. The latter usage of the word is not a mistake though. The intent is to make it sound desirable. The big change is that Medicare would no longer provide coverage for medical care but would be a subsidy towards the purchase of a privatized insurance plan. No surprise. Ryan wants to privatize Medicare. Instead of Medicare paying directly for care, there will now be a private middle man. A middle man that needs a profit. People will have to pay for shareholder dividends and corporate profits. This will drive up costs. In addition, Medicare will lose their single payer negotiation leverage over hospitals, care providers, and drug companies. Again, this will tend to drive up costs. 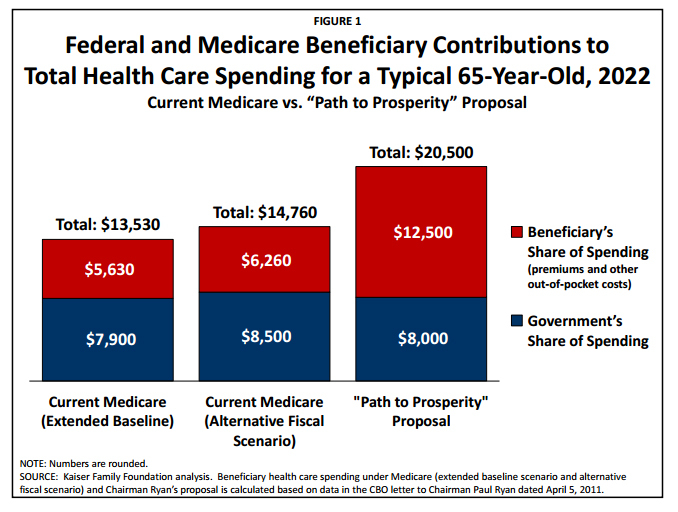 According to a Congressional Budget Office assessment of Ryan’s 2011 plan (the basis for subsequent versions), as reported by Kaiser Family Foundation, out-of-pocket costs for a typical 65-year old would be more than twice as large under Ryan’s plan as under traditional Medicare. 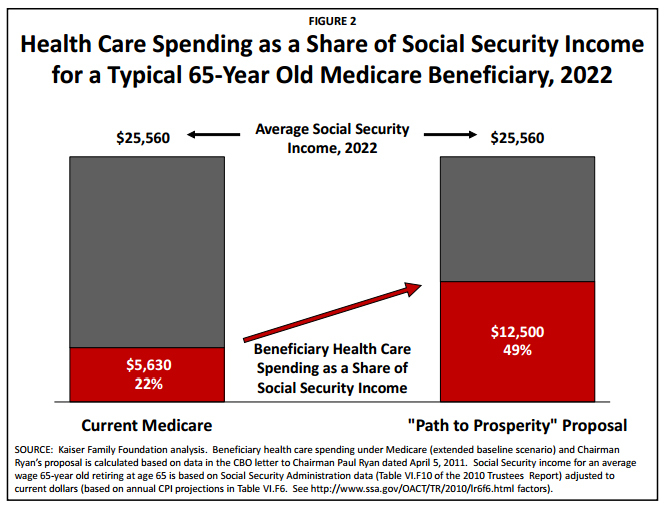 As a percentage of Social Security spending, a typical 65-year old would spend 49 percent of their benefits on health care instead of 22 percent. Plans would be prohibited based on the health status of enrollees, and would be required to charge the same premium to individuals in the same age group, according to the CBO. This may suggest that plans would be permitted to vary premiums by age, charging higher premiums to older beneficiaries and lower premiums to younger beneficiaries. In such a scenario, 85-year olds who choose to be covered under the premium support system in 2022 could face significantly higher costs than younger Medicare beneficiaries. Since healthcare will cost more and the costs will be shifted onto you, you will be able to afford less. The total cost of providing Medicare benefits to enrollees is expected to rise under the proposal, according to the CBO. This is because private plans have higher administrative costs and typically pay higher fees to providers than Medicare. While private plans may be able to achieve lower utilization through tighter cost and care management practices, the CBO believes the total costs of providing a similar benefit package would be higher under private plans than Medicare, and that the differential between the costs under traditional Medicare and the costs under private plans would widen over time. Lower utilization? What does that mean? That means that private companies would put practices in place so that it would be used less. If you’ve ever had to deal with insurance companies, you know what these practices look like. They look like trying to deny you coverage. In other words, you will get less. And it will still cost more. According to the CBO, a privatized plan would be 34 percent more expensive by 2022. If the plan is so bad, why is it being proposed? There is only one reason: To shift the costs onto you. It’s another “privatize the profit, socialize the risk” scheme. You will pay more and you will get less. This is the only “magic.” And if we sell off Medicare, we will never get it back.